When life gets tough, it is healthy to find something that you really love to help the time go by more smoothly. Everyone has their passion, be it sports, music, academics or other hobbies. Some such activities take more training than others, and one of those is sculpting pottery. 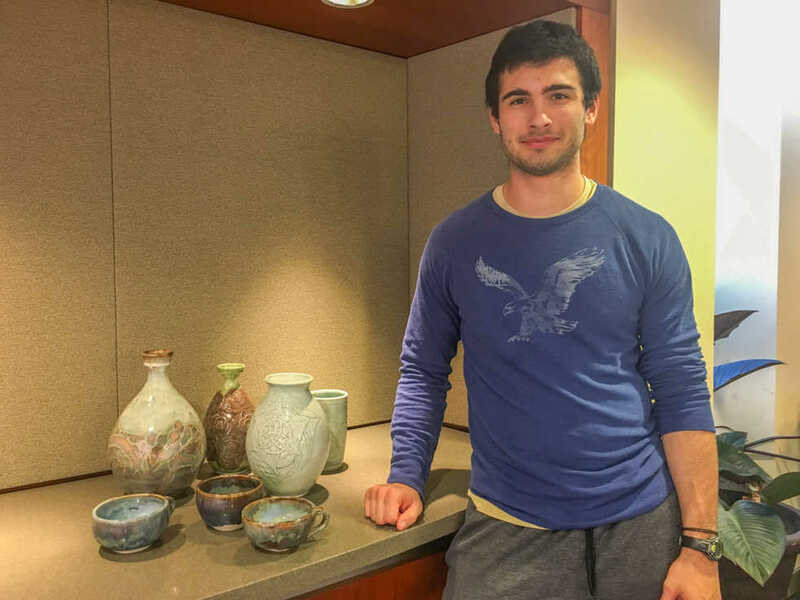 One student of this art is Zachary Houillion, a third year CHBE whose creative outlet happens to be expertly crafting mugs, bowls and vases ­— and winning many awards for his designs. Houillion has been working hard since the beginning of high school to make his craft what it is today. Houillion has always had a deep appreciation for art, learning many classical Romantic pieces on piano from a young age. He knew and appreciated beauty through many forms of art and wanted to find a way to express his own creative tendencies through something truly his own. Initially he just wanted to fill an arts requirement for his high school and intended to do that through drawing. After not getting into a drawing class, he began taking art history with a ceramics portion. The rest, as they say, is history. In high school, Houillion worked until 9 p.m. after school every day, practicing the process of preparing clay, putting it on the wheel, letting it dry, trimming it, carving it, putting pieces into the kiln and so on, over and over. Houillion learned to put his own perspectives into his work, adding many deeper meanings to his newfound skill. Houillion has a unique perception of art, through which he sees mathematics, nature and art as one in the same. This is very evident in his pottery, where he uses fractal patterns combined with many nature-influenced designs, such as roses or tree branches. “There’s certain uniformity to the way things flow in nature and the way things look — be it mountains, or trees or flowers — there’s patterns in each one, and I just try to capture that,” he said. However, he lets people choose their own interpretation of his works for themselves, even though he does put a lot of his own personal meaning in each and every piece. Even so, he is slow to become attached to his ceramic designs as he knows they are extremely fragile. Houillion learned this the hard way when one of his most intricate works was blown over by a gust of wind, shattering it to pieces. Many people would be crushed after spending over 20 hours trying to perfect such an intricate piece, but Houillion knows this is just a part of making ceramics and keeps his head up anyway. Even after suffering an injury that prevented Houillion from pursuing sports, he did not give up. Instead, he spends even more time perfecting his works of art. Houillion uses his love for ceramics as an outlet, allowing him to step back for a while, forget about his problems and fulfill his desires to become even more versatile with his pottery. Houillion continues to make and sell his ceramic designs on Etsy and wants to stick with his love for ceramics for the foreseeable future. He has received many accolades for his designs, including winning two YoungArts Presidential Scholar in the Arts merit awards and four National K-12 Exhibition awards. He has also been featured on the front page of Reddit. Even with all of these successes, Houillion feels he has a lot left to accomplish in the world of ceramics. Perhaps one of these things is teaching; he currently shares his skills by teaching classes in Paper and Clay on Wednesday evenings.